Brad Keselowski, whose weekend was put in doubt when he severely injured his ankle during a test session early in the week, held off Kyle Busch to win the Good Sam RV Insurance 500 at Pocono Raceway on Sunday afternoon. The victory was the second of the season for Keselowski and the third of his career. It also moved him closer to securing his first berth in the season-ending Chase. The victory moved him from 21st to 18th in points and puts him in great shape to win a Wild Card playoff berth at the very least. How did he manage to post a victory at one of the toughest tracks on the schedule and one which now requires gear shifting? Busch, who had led 27 laps, finished second. Kurt Bush was third and defending five-time champion Jimmie Johnson was fourth. Rounding out the top 10 were Jeff Gordon, Carl Edwards, Greg Biffle, Dale Earnhardt Jr. and Paul Menard. The Keselowski injury – a broken ankle – was suffered during a crash at Road Atlanta’s road course. The ankle swelled up to the size of a grapefruit and the team told Sam Hornish Jr. to stand by in case Keselowski could not start – or not finish – at the 2.5-mile triangle at Pocono. Keselowski, who did sit out Saturday night’s Nationwide Series race at Iowa Speedway, said there was no way anybody was going to take his place in the No. 2 Cup Penske Racing car. He led 19 laps in getting the victory at Pocono. Denny Hamlin led a race-best 65 laps but had his hopes for a victory were doused when he had lugnut problems on the final pit stop of the day. But it looked like Hamlin’s Joe Gibbs Racing teammate who would get the victory as the race – which was stopped for an hour and three-quarters by rain – wore toward a conclusion. JGR’s Kyle Busch had passed his brother Kurt Busch for the lead with 38 laps to go and was comfortably leading the race with a 2.2-second lead after the final green-flag pit stops of the day when a caution flag was waved for a wreck involving Kasey Kahne and Juan Pablo Montoya. 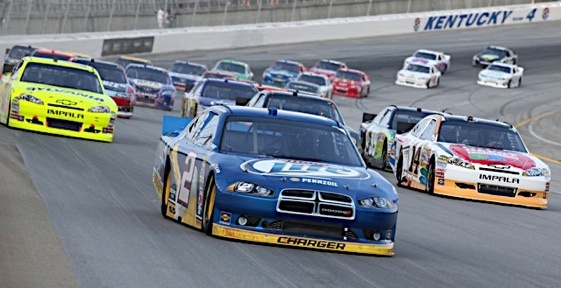 Keselowski jumped to the lead on the restart, which came with 16 laps to go. Busch tracked him from about five car lengths back but never could make the pass for the lead. After the race, Johnson and Kurt Busch had heated words in the pits. Johnson accused Busch of roughing him up. Busch said he was “just racing” and added sarcastically that he did not know he was supposed to pull over to let the five-time champ past.